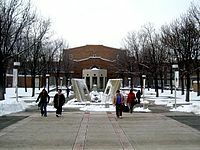 Salt Lake Community College (SLCC) is Utah's largest two-year college with the most diverse student body. It serves more than 60,000 students on 10 campuses as well as through online classes. The college has a student to faculty ratio of 20:1. Since SLCC is a community college, it focuses on providing associate degrees that students can transfer to any other four-year university in the state to satisfy their first two years of requirements for a bachelor's degree. SLCC has open enrollment and serves the local community, with approximately 95% of the student body considered Utah residents. 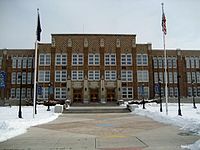 Located at 1575 South State Street in Salt Lake City, the South City Campus occupies the former home of South High School. The campus houses classrooms, labs, and the Grand Theatre, home of the Grand Theatre Foundation and Community Institute. The Grand Theatre facility includes the Historic Fashion Collection, some 1,900 costumes ranging from 1890s to the present. In September 2014, The Utah Board of Regents named Deneece Huftalin as the SLCC President. She served previously as Vice-President of Student Services. She replaced Cynthia Bioteau. SLCC offers over 200 degree and certificate programs in academic, technical, and vocational fields. It is accredited by the Northwest Association of Schools and Colleges, and many credits are transferable to the state's four-year colleges. More SLCC graduates attend the University of Utah than graduates of any other institution of higher learning. The SLCC Bruins have competed in the National Junior College Athletic Association (NJCAA) since 1985. Currently, the school fields men's teams in baseball, basketball and soccer, and women's teams in basketball, softball, volleyball and soccer. The Bruins have produced 54 NJCAA All-American athletes since 1985, and has produced 513 Academic All-Region honorees and 192 Academic All-Americans. The men's basketball program advanced to the NJCAA championship game in 2008. The following season, the Bruins returned to the title game, this time defeating Midland College to claim the first national championship in school history. The Bruins returned to the title game in 2016, winning their second championship by defeating Hutchinson Community College, 74–64. Salt Lake Community College's mascot is a Bruin Bear, "Brutus". He is seen at local parades and performs at the Women's Volleyball and Men's Basketball games. Brutus has his own Facebook page.